It’s been three minutes since I booked a taxi ride on my smartphone; not quite enough time to get to the road outside my office in Rosebank. My taxi driver has already arrived and is calling to let me know. I find a white Mercedes C-Class pulled up at the kerb. There is no taxi sign on the car, but I recognise it immediately: the app that I used to book the ride gave me a description of the car and a photo of the driver. A tall, slim man wearing a white-collared shirt and brown leather jacket offers me a generous toothy smile. I already know his name is Wonderful and he has a “user” rating of 4,5 stars. Wonderful Ndou, 43, is a driving “associate” of Uber, the company that allowed me to book my taxi ride and pay for it. But Uber is not a taxi company. It’s a firm that “seamlessly connects riders to drivers” through its smartphone applications. The strategy has allowed Uber to expand at an incredible rate — since its founding in 2009, it now operates in more than 70 cities across the globe – with minimal administrative requirements and a fraction of the overhead costs of a regular taxi company. In some countries, it is capitalising on legal loopholes, provoking the wrath of its more established rivals. According to the Guardian, it is facing or has faced bans, restrictions, court cases or protests in Brussels, Paris, Berlin, Houston, Portland, New Orleans, Seattle, Miami, New York, San Francisco, Chicago, Washington, DC, Vancouver and Toronto. Opponents argue it’s a taxi company in all but name, and that it unfairly gets around the licence fees traditional taxi companies are obliged to pay. Uber guarantees a high-end private driver experience by “partnering” with drivers who take on their own business risk. Uber drivers must provide their own vehicle — in South Africa you can expect a Mercedes C-Class, a BMW 3-Series or an Audi A4 — have a professional driver’s permit, and partners pay for their own passenger liability insurance. When the ride is complete, Uber debits your account and e-mails you an invoice, with a map of the route and how long it took. No physical cash is exchanged. You can then rate your driver; something to which Uber attributes its “predictably high” service standards. 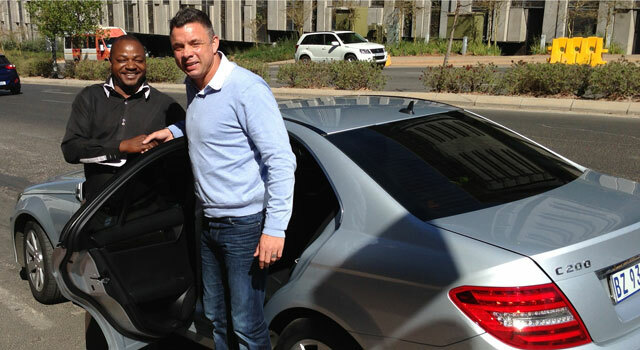 “With Uber, the rider can count on having a consistently safe and pleasant experience,” says Le Roux. Ndou says he likes this feedback. “For me, it’s all about service,” he says. He joined Uber seven months ago, soon after its August launch in the country. He had previously worked for a high-end shuttle company, mainly transporting VIPs. Ndou’s car was owned, serviced and insured by the company. In exchange he paid monthly “dues” — a set fee — and then kept the money he made. Uber charges its minimum R50 fee for the 1,5km trip we take. Because I spend another 40 minutes talking to the driver, the final cost comes to R82. It’s a short walk to the nearest taxi rank. I hop into a metered taxi to get back to the office. The driver asks for his name to be kept out of the newspaper. Like Ndou, he owns his own car — an aged red Toyota with poor ventilation.